The Merc with a is breaking 4th walls and leaping out of flames, pouncing on unsuspecting losers! The Marvel Comics Deadpool Ambush MEA-004 Mini Egg Attack Vinyl Figure - Previews Exclusive is an adorable non-articulated Deadpool vinyl figure that features a themed base and stands about 3 1/2-inches tall. 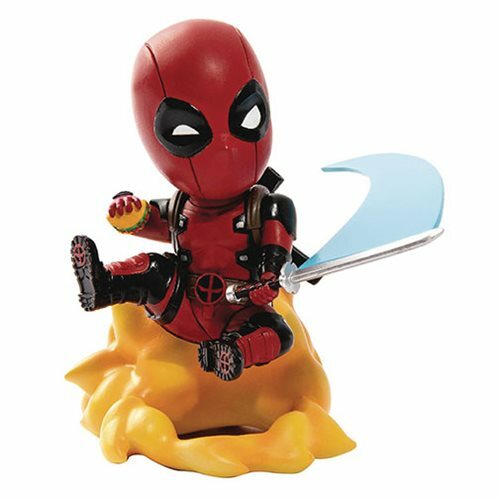 This Deadpool Ambush Mini Egg Attack Vinyl Figure - Previews Exclusive has the Merc with a Mouth atop a flame display base and is wielding his katana with his left hand, while holding onto a taco with his right hand. What a multitasker Deadpool can be!